Firms are creating their own power sources – shortage of power, power outages causes by hurricanes and the increasing cost of power are forcing companies to create their own private power sources or electricity generation units. As the WSJ reports – Kroger Company (a Cincinnati based grocery chain) is one such example. At one of its big food distribution centers, the company has installed a tank system that uses bacteria to convert 150 tons of organic waste and unusable damaged food products into biogas that is burned on site to produce 20% of the electricity the center uses. Elsewhere on a hill, two big wind turbines produce electricity for the company’s hilltop dairy unit. Four Kroger grocery stores use solar panels for electric output. These Power generation projects are saving the company $160 million a year on electricity. The reducing costs of both solar panels and natural gas are making more companies produce at least a part of their own power requirement. Walmart produces 4 percent of the electricity it uses through solar arrays on stores’ roofs and intends to produce 20% by 2020. Google a while ago installed big solar arrays on top of its silicon valley Googleplex campus and so did Apple at its Cupertino headquarters. BMW gets half its power from its own onsite Power Center that burns methane piped into it from a nearby garbage dump. 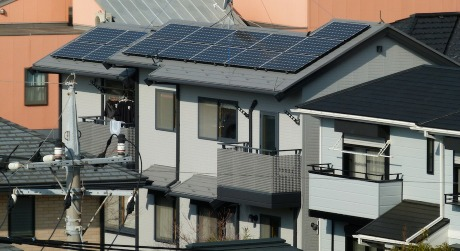 Japan is well ahead of other countries – with increasing usage of residential fuel cells. A fuel cell is like a battery – creating energy through a chemical chain (except they don’t run out overtime like batteries do) – they can produce electricity and heat continuously as long as fuel and oxygen are available. Residential fuel cells when combined with solar panels gives homes round the clock power supply – its a less wasteful, more self-reliant approach that’s being seen not only in companies, but also homes.